The staff at the Mendon Village Animal Hospital wants to share with you how one yellow Labrador is beating the odds and living with congestive heart failure. Lizzie was born on February 16, 2004. She was brought into our veterinary hospital by her breeder. As part of her exam Dr. Stuart Gluckman listened to her heart and was able to hear a significant murmur. He ordered an ultrasound to confirm his diagnosis of Tricuspid Valve Dysplasia, or TVD. TVD is a congenital heart defect in which the Tricuspid valve doesn’t close properly, allowing blood to leak back through it. Unfortunately, TVD leads to congestive heart failure. Puppies with severe TVD often don’t make it to their first birthday. Jen, fell in LOVE with her immediately. She decided to take her home and give her the best life she could for however long was possible. On July 7, 2004 Jen took Lizzie to Cornell for a cardiology consult. The cardiologist warned Jen that Lizzie would likely start to exhibit the symptoms of congestive heart failure within a couple of months. To everyone’s surprise, Lizzie stayed symptom free for three years! Lizzie went into congestive heart failure in September of 2007. Her chest filled with fluid and she had to undergo multiple “chest taps” or thoracocenteses. A thoracocentesis is a procedure in which the doctor places a needle between the ribs and into the chest cavity in order to draw off the accumulation of fluid in the chest. Each time Lizzie needed a chest tap she needed to be sedated. Jen took Lizzie back to Cornell and was given a grave prognosis. The best option was to start Lizzie on a medication regimen that would help control Lizzie’s disease, as there was no cure. Jen had to try to prepare herself to lose Lizzie at any time. Seven years later, Lizzie is alive and thriving! 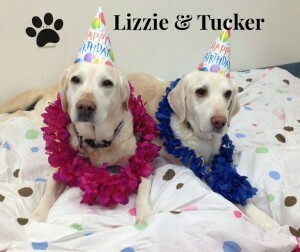 She recently celebrated her 10th birthday right along with her litter mate Tucker, who was born with megaesophagus and lives with our office manager Amy. Lizzie is the sweetest, happiest dog… you’d never imagine she’s sick. While Lizzie has been in congestive heart failure for seven years now, Jen works hard to control her symptoms with a range of medications, including Vetmedin, Enalapril, Salix and Spironolactone. Lizzie also receives supplements, including COQ10, Rutin and high doses of fatty acids. Lizzie has definitely beaten the odds. Jen counts herself extremely lucky to have been given the gift of all this time with her.